Last weekend the Raspberry Pi community came together in Cambridge to celebrate the quirky computer's third birthday. It's achieved an incredible amount in its short lifetime, helping to transform education and finding its way into schools, homes and offices all over the world. Perhaps its greatest achievement, though, is the community it's built, and the birthday party gave a real taste of that. People flew in from Germany and France, and travelled from all over the country to join the fun. On entering the building, we were greeted by a giant throne with an arch of balloons over it. From tiles provided, you could assemble a placard and sit on the throne to be announced as "the messy inventor of wonderland" (Pete Lomas's choice of words) or something similar. This was one of the many Raspberry Pi projects on show during the weekend. There were lots of robots, and the CamJam obstacle course was available for testing their mettle. There was an Astro Blaster arcade cabinet that had been lovingly restored as a desktop unit powered by a Pi, and a handheld Spectrum emulator. You could have your photo taken in bullet time using a ring of Raspberry Pis with cameras, and find out how naughty or nice you were with an end-of-the-pier style attraction that scanned your hand. The Easter bunny was present too, pooping out Mini Eggs when you pressed a button. My co-author Mike Cook brought along several of his projects, including a game where you have to vigorously shake a real bottle to empty the sauce on screen, and a random jazz generator. I was delighted to have a chance to meet him, given that we'd worked on three books together without previously crossing paths in the real world. There was a programme of workshops. On the Saturday, I helped to run a Scratch hackathon, where about 20 children and young people coded games and wrote programs that controlled LEDs from the CamJam EduKit. We had a show and tell session afterwards, where many of them shared their creations in the main lecture theatre. 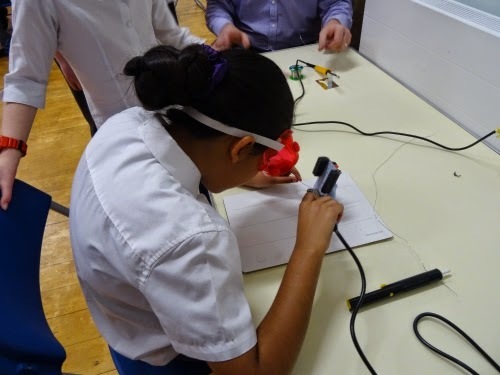 It was great to see what they could achieve in two hours, without ever having done any electronics on the Pi before. 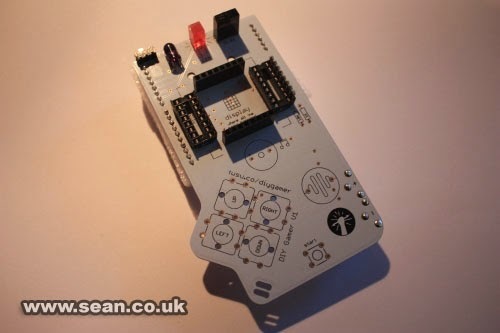 If you couldn't make it to the session (or even if you could and want to explore more), you can find my guide to getting started with ScratchGPIO and the CamJam kit here. Phil Atkin gave a great presentation of his synthesiser software, showing how he'd recreated the sound of an expensive Moog synth using the Pi and some highly optimised code. Now that the Raspberry Pi 2 has come out, he says there will be lots of original Pis that people don't need any more. His hope is that they can find their way into schools together with his synth software. Since music is one of my hobbies too, I'm very much looking forward to the general release of the software. Kieron Spinner ran a workshop on Node.js, with a demonstration showing how it can be used to enable an LED connected to the Pi to be remotely controlled over the web. As a prototype for the Internet of Things, this was a great demonstration, and he's keen to collaborate with others who are similarly excited by the technology's potential. On Saturday evening, there was a party with balloons and cake and raspberry beer and games and music and oh, so much more! It really was a great celebration, and was generously supported by the sponsors who donated prizes. In pass the parcel, everybody won. My prize was a motor controller board from Ryanteck, which I look forward to trying out! Everyone left with a party bag too, which included a free ebook from O'Reilly, stickers, cables, Magpi magazines, pens and more. I enjoyed the music performance, in which Sam Aaron live-coded with Sonic Pi, accompanied by a guitarist. The highlight for me was having an opportunity to chat to people, which I feel like I did almost continuously for two days! I got to meet many people I know virtually for the first time, see some people I know again, and meet some new people. Sunday was a particularly good day for this because I had a show and tell stand where I was showing my Minecraft Maze Maker, Scratch burglar alarm, some Scratch games and a selection of Raspberry Pi books. It was lovely to meet some existing readers and to be able to introduce the books and even the Raspberry Pi to some others. While the event was driven by Pi die-hards, it was wonderful to see people there who were buying their first Pi and exploring what they could do with it. Thank you to everyone who visited the stand, especially with so much other stuff going on. 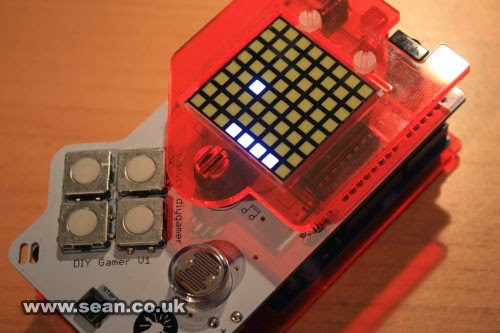 I took the opportunity to do some shopping too, and bought some add-ons from Pimoroni. 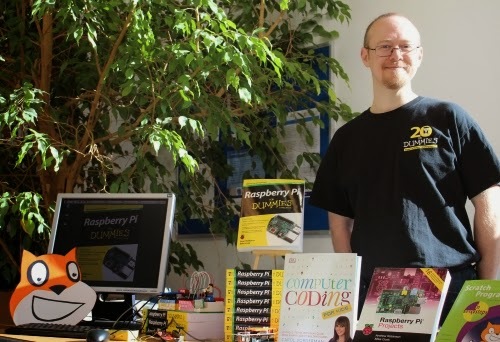 It was nice to see some businesses that had been established around the Raspberry Pi, showing how it has helped to drive enterpreneurialism, especially among young people, a couple of whom have gone from university to running a Pi-based business. There are so many people to thank, especially Mike Horne and Tim Richardson who organised the programme, Lisa Mather who orchestrated the superb prizes and goodie bags, the many marshals, the Raspberry Pi Foundation and all its members who made everyone welcome and the sponsors who generously supported the event. I had a fantastic time, but with so much going on, I know that I missed a lot of what was on offer. If anyone's looking for a project for their Pi, I have a suggestion. You'll need a comprehensive understanding of the Pi, electronics, and the space-time continuum. I know I'm asking a lot, but if any of you can build a time machine in time for the next party, it would be mighty useful. In fact, given it's a time machine, why not build it in time for the last one? How about it, eh?